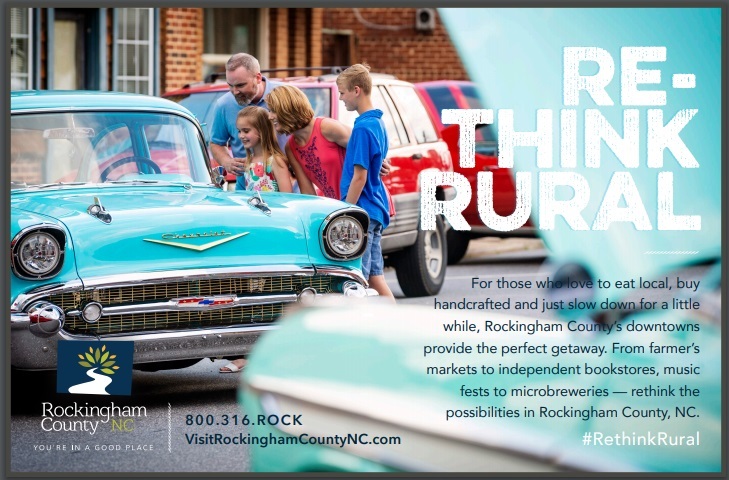 The Rockingham County Center for Economic Development, Small Business & Tourism and the Tourism Development Authority (TDA) have launched a new advertising campaign to promote Rockingham County to potential visitors. The new campaign includes a series of print ads as well as a one minute and half promotional video. 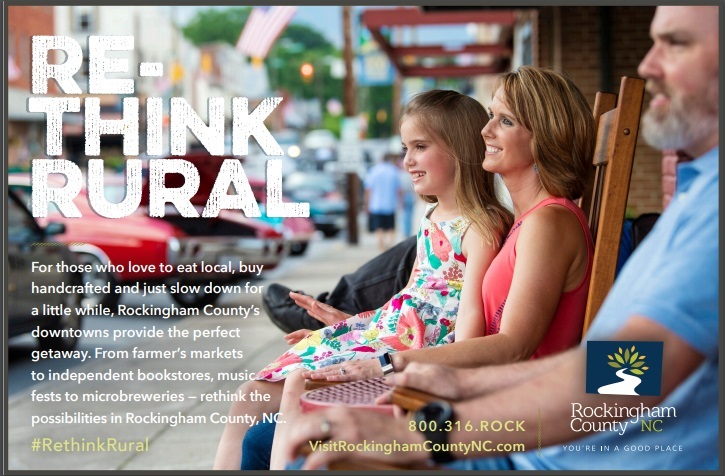 The concept, “Re-Think Rural,” compels audiences to consider the benefits of spending time in a rural community like Rockingham County. 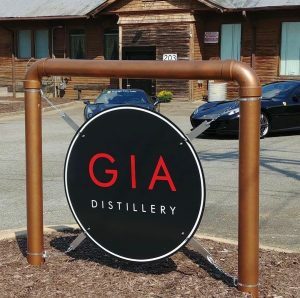 It is based on the fact that all too often when North Carolinians crave time with nature, they head for the mountains or the beach. But those destinations can be far away not to mention crowded. 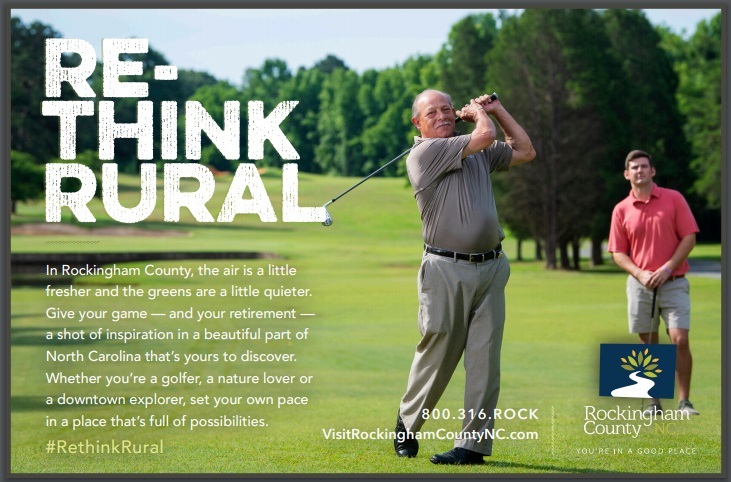 This campaign promotes the beauty of Rockingham County and the variety of things to do here in four main themes: trails, water recreation, small towns/downtowns, and golf/retirement. The video features scenes from local downtowns, farmer’s markets, mountain bike trails, rivers, shops, golf courses, and the Eden Drive-In. 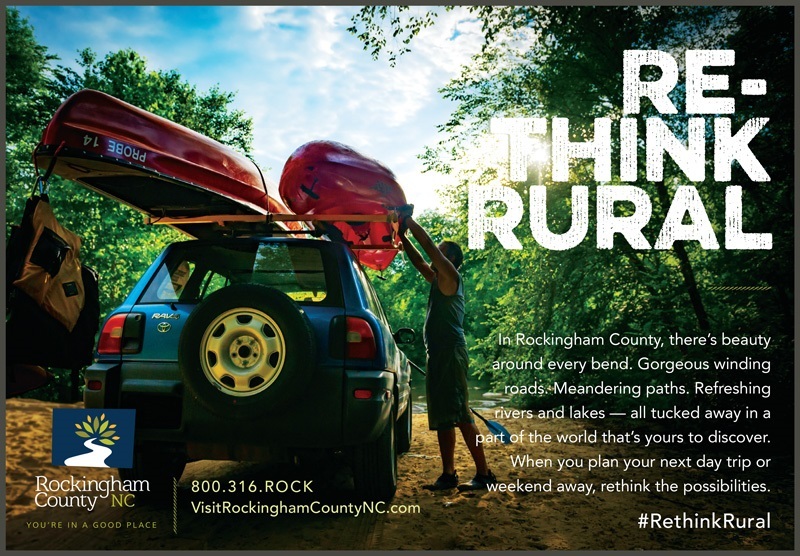 The Re-Think Rural campaign pulls in readers with gorgeous photography, a headline and copy that beckons them to come explore all that Rockingham County has to offer while keeping this region top of mind the next time they are ready for a fun and rejuvenating time away from home. This concept also allows for a nice hashtag campaign as well as a call to action that can reinforce a sense of pride in rural living and adventuring. “We are very excited to launch the Re-Think Rural campaign. 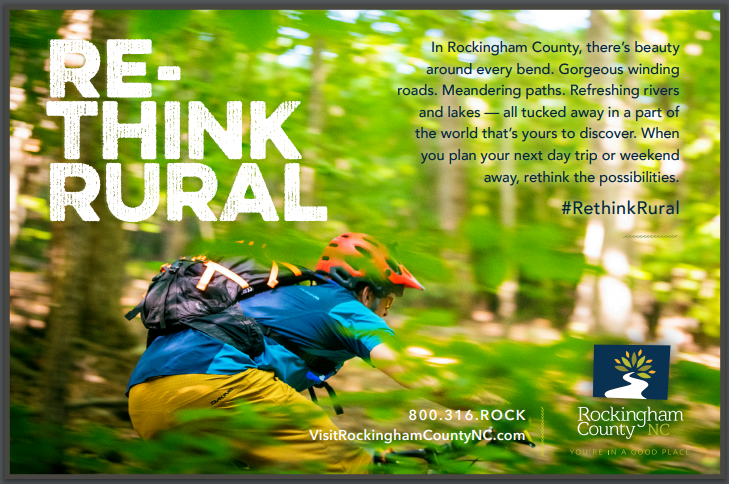 It communicates the message that whether or not you want to hike, bike, canoe, fish, play golf or visit a local coffee shop, the possibilities in Rockingham County are impressive and open for discovery,” said Robin Yount, tourism manager for the Rockingham County Center for Economic Development, Small Business & Tourism. 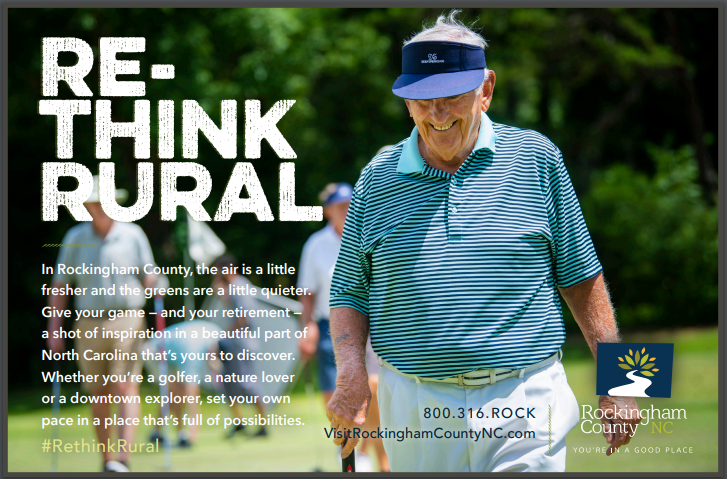 Print ads began running this summer with placements in publications such as Our State magazine, Explore Rockingham County, and Travel Host-Triangle. 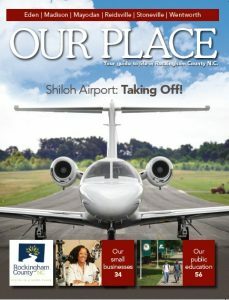 The promotional video will be used on the tourism web site and shared via social media, in presentations and played during trade shows/special events. A 30 second commercial will be developed from the video early next year for a spring/summer television ad campaign. 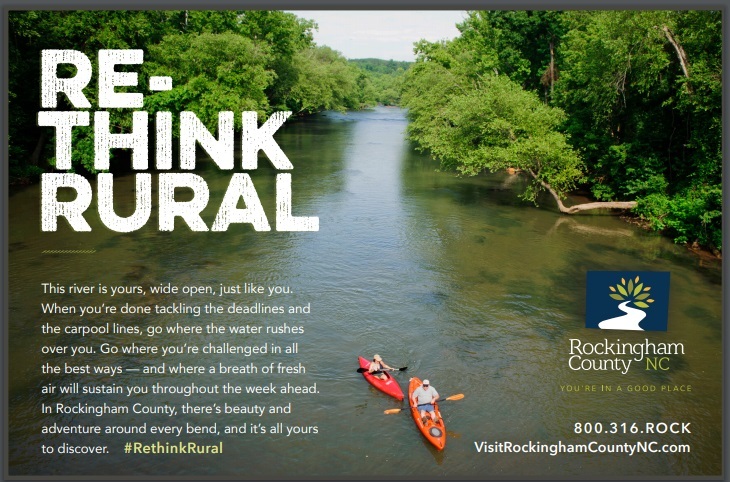 The Re-Think Rural campaign was created by Tigermoth Creative, a marketing and communications agency in Greensboro. The series of print ads are below. Watch the new video HERE.